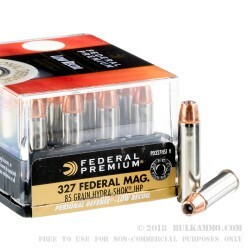 These .327 Federal Magnum cartridges will set up your Ruger or S&W M632 revolver for self-defense. 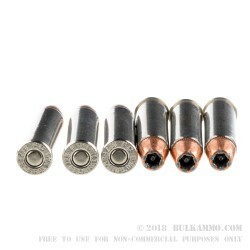 Using a light 85 grain Hydra-Shok bullet, these rounds achieve a muzzle velocity of 1,400 feet per second and a muzzle energy of 370 foot pounds for impressive defensive power. Despite this strong performance, this load generates mild recoil, a major advantage in the small CCW-oriented revolvers it is designed for. 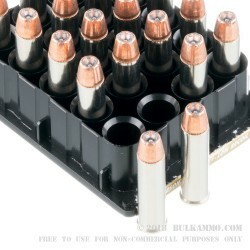 Each round in this box of 20 uses Boxer-primed nickel-plated brass casings. Federal Premium Ammunition’s Hydra-Shok series is one of the most popular self-defense loadings available. The company continues to build on the brand’s success with HST, its newest offering. 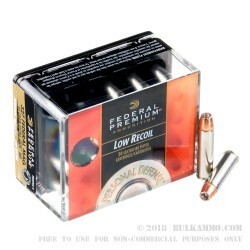 Other well-known Federal offerings include Power-Shok hunting rounds and shotshells and Fusion bonded-core sporting hollow points. A subsidiary of Alliant Techsystems, Federal is based in Anoka, Minnesota, where it has operated since the 1920s.